Self-reinforcement coaching with the seesaw technique is a tool with which the stance of a value-oriented, compassionate observer can be trained. This is done by looking from different perspectives at one's own action in a concrete situation. Aim of the technique is to take over a standpoint full of interest, instead of arguing with "right" or "wrong", and change the perspective on the situation and one's own action in this situation several times - as if one were swinging back and forth on a seesaw several times without being rigidly fixed to one side. This multiple changes of perspective helps to explore the meaning of a single personal action for the direction of one's life in that moment. Coaching with the seesaw technique is thus a tool for one's own self-awareness (observer-self as opposed to a rigid self-concept). With a rigid self-concept we are fixed across different situations (e.g. "the self insecure", "the clever", "the understanding therapist"); it can limit ourselves if we believe we must always live up to these concepts. We lose flexibility, because not every situation requires us to do the same. However, the orientation towards personal values (towards what is personally important to us) can give us a more flexible orientation. This flexibility can be trained with the seesaw technique. Enhancing psychological flexibility is the core concern of Acceptance and Commitment Therapy (ACT). The most important rule of self-reinforcement coaching with the seesaw technique is to pick out only one concrete personal action in a certain situation! This action is the pivotal point to which the complete coaching refers. It should be something where one has behaved as one wish to be as a human out of the deepest hearts (towards-action) - not as we believe we ought to be. Since the focus on a specific action is so important, the action may often be explicitly repeated in the course of the coaching. And here comes already the second hint before the concrete instruction: formulate in whole sentences with many connective words ("therefore", "due to", "because of"). This has the reason that our mind is a refering machine. The mind is trimmed to make connections (e.g. to construct cause-effect connections) - this makes it a powerful problem-solving machine. However, it also links arbitrarily events together - even without having a physically experience. It is able to preserve us with its conclusions from new experience (e.g. by avoiding situations because of fear; cf Relational Frame Theory - RFT). However, we can consciously use our mind as a linking machine and train it to construct new relationships in order to become more flexible. Therefore: formulate in whole relative sentences! 1a) Name a concrete towards-action as a starting point for self-reinforcement coaching. Describe all components of the towards-action that had been excecuted in a particular situation. 2a) Imagine (and then name) what one would have done unfavourably in the same situation under the same conditions (away-action in the same context) - after all, we know ourself best and usually can say very well how we secretly chicken out (e.g. avoid the danger of embarrassing ourselves or being exposed to feelings of guilt or failure). 2b) Imagine an inner counsellor, it does not matter whether male, female, a mythical creature or an inner voice with a certain timbre. Imagine a counsellor who - in principle - means well with us and who pleads for the presented away-action. Formulate concretely which arguments this counsellor chooses, which connections he sees and above all: 2c) from which unpleasant feelings he or she tries to protect us with his/her argumentation. Then change and 1b) now let the towards-counsellor give his/her advice, who encourages the implemented towards-action with his arguments. Let him/her also explain how he/she justifies his/her encouragements; let him/her explain this perspective! And still remain fair, because it should 1c) be clearly to named which inner emotional obstacle he/she demands to take with his/her plea for the towards-action. Rocking between the perspectives of the "counselors" is not about exposing "right" or "wrong" thoughts, nor is it imperatively about the thoughts that were actually thought in the situation. The rocking is indeed about creating awareness for the respective possible perspective fostering different actions, as long as emotional shortterm-"shelter" or emotional "risk" can profoundly be named. 2d) Assume which unfavorable consequences the imagined away-action would presumably have had in this one situation, and 1d) describe which actual consequences were experienced shortly before, during and after the towards-action. "Finale furioso": i.e. spend a lot of energy for the connection between the one specific towards-action and the personal meaning = 3)!!! and hereby, work out what was personally valuable about this one towards-action. Clearly identify the value that was lived at the moment of the towards-action. Then, make yourself aware of the direction your life would take if you were able to act in this way again in similar situations. Finally, encourage yourself to strengthen your personal value by taking another action for the same function (when will you do it?, towards whom?, how will you do it in another context?). 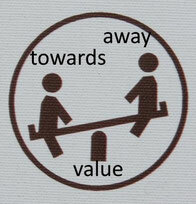 The seesaw technique ist best applied for making people aware of the personal value of very small-scope towards-action outside the familiar personal comfort zone. It's like a highlighter which function is to remember inconspicuous text passages that would otherwise be easily overlooked. Inconspicuous text passages that nevertheless conceal an important meaning. In order not to miss this personally important meaning, one sets the highlighter, and brightens up the corresponding passage. From this point of view: every baby towards-step outside the usual short-term comfort zone is worth making into a personal "highlight". For this, it is necessary to slip into the role of a coach and make aware of the meaning of this action in contrast to the possible alternative action.